Plan on trying my hand at making a shooting bag for my Son. Something durable and long lasting, simple but nice. He is an adult and has a nice rifle and is an avid BP hunter. Not a range shooter so it doesn't need to be too large. Nothing too extravagant but will do the job. Re: MAking a shooting bag....? I’d recommend “Recreating the 18th Century Hunting Pouch “ by T.C. Albert. Very clear instructions, lots of pictures, and several different full sized patterns in the back of the book. It’s a great resource. I'll Second that, you Will not be disappointed. I'll third that. T.C. Albert's book will tell you all you need to know about making a shooting pouch and even includes some patterns. My first two turned out ok and that's the only book I ever read on the subject. T.C. Albert's book is certainly a good one for beginners and you should probably start with it. However, don't overlook Ken Scott's DVD and template set. You don't have to include all the features in his example. My personal favorite is Jim Webb's book on southern shot pouches and powder horns. There are a lot of small, simple pouch designs in there. Just cut templates out of brown craft paper. You can make sure the paper templates work for you before cutting leather. Mark, I finally located a copy of Jim Webb’s book, and am anxiously awaiting its arrival! Everything I read about it is great. His newest book is on my list of purchases for the CLA show. T.C. Albert's book is great, and is probably the best single resource out there. Another book that is well worth looking at is Stohlman's The Art of Handsewing Leather - Stohlman was the late Chuck Burrow's invariable recommendation for a resource on general leather working. As for patterns, Madison Grant's article in Bucksinning III has a couple unscaled diagrams, and Steve Lalioff's article in Buckskinning VI and LaCrosse's The Frontier Rifleman contain scaled drawings that could be made into patterns. For a simple pouch, though, it is quite easy to come up with your own pattern. Usually I make a dummy out of paper stapled together to test the pattern before cutting into leather, and I've been known to do a trial run using denim from recycled pants as well. Only real problem is figuring out how much extra to allow for the stitching. Thanks, I'm going to pick a copy up too.. I've been looking for a used copy.. Invest in Recreating the Hunting ouch DVD from Pioneer video that features Ken Scott. He discusses different patterns of appropriate pouches and then takes you through making a pouch step by step. Seeing it done, and being able to watch it over and over again, will take you well into building a pouch that not only meets your needs, but also one that you will be proud to wear. Ken's approach is easy to follow and will make you fully plan your pouch before you get started. And we all have fallen into the trap of starting a project only t find out the the details we needed to address at the beginning cause unwanted modifications during the construction. I create my own patterns on Powerpoint on the computer. That way you can try out the design of the bag in paper before transferring it to something more substantial to become a pattern. I looked at Madison Grant's book and then winged it. Has worked for me for maybe 20 years now. Many were homemade and need not be like any other exactly. I ordered one of these books the other day. I'm looking forward to reading it. I think this weill be a good father daughter project. My thoughts would be to start at the leather supplier, I would find a piece of leather that I think is appropriate, in size and thickness of the leather. Then design the bag around the piece of leather. I doubt if there were patterns in that era, they used what they had or could barter for. In the above, you will barter with cash for what you think you need, and then made the item to fit your needs. Ken Scott's DVD and printed materials are top notch. He has a great way to relate details in an understandable fashion. GO FROM THERE. My first bag was from Crazy Crow trading post and came as a kit. It’s a good foundation to build what you want and to learn how to build a bag. You can chance the strap, add a horn etc. 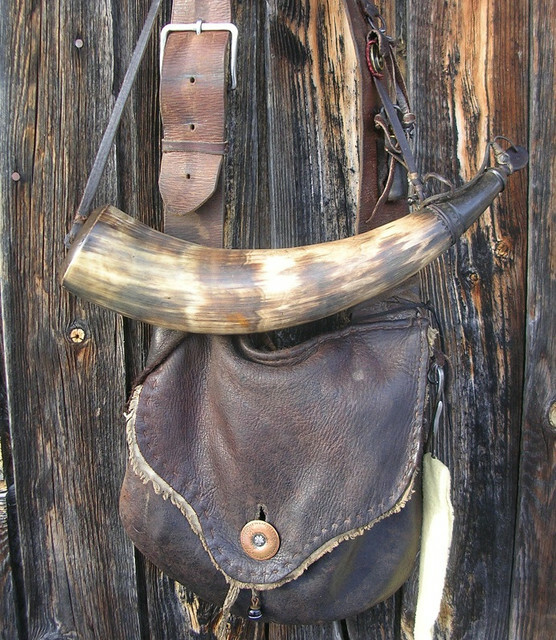 Creating a bag and a horn for that matter is all a choice of the builder. Granted most of us want to be HC and even "add some age" to our productions. I know I do. But, really, if we study the bags that have survived we can easily see that they were (other then some later military bags) very utilitarian. Generally made from what may have been available and at the level of ability of the "builder." They were built to serve a purpose.... carry the needed items, making them available to the shooter as needed. I really like working with leather and cloth combination bags. It just seems to me that in certain areas of the country that may have been quite common. I like the pre rev stuff on up through the early 19th century.